Unless you’ve been living under a rock you’ve probably heard about the Jimmy Choo collaboration with H&M. Personally I’m not that excited. H&M have already announced a wristband queuing system for shoppers and let’s all be honest as to why… they have probably only bought a limited amount of stock, just like with the Matthew Williamson collection. If you bring a designer to the high street to make it more accessible for the masses, I don’t think you should limit stock so most people never get a look in. The reason I mention H&M is because you’ll notice the use of zebra print in bags and shoes within the collection. 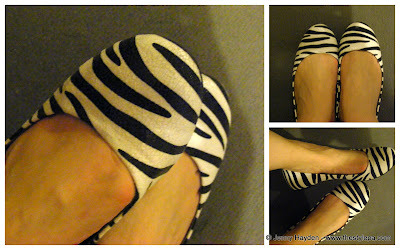 Black and white is always a classy combination and as soon as I saw the zebra print I knew I needed to get something in that pattern. Their zebra pumps are £49.99 and they even have a note to say you should replace the soles before wearing. You what! They may be suede, but I don’t want to spend money on repairing them before I start wearing them. If standing in a queue is not your idea of a good time (it certainly isn’t mine) grab yourself some cute zebra pumps from Blue Inc instead. A complete bargain at £14.99. I’ve partnered up with them to pick out some of my favourite bits and these flats were top of my list. I wore them last night with a sequin dress, leggings and a boyfriend blazer. So glad I didn’t wear heels or I’d have been hobbling home from the festivities. What do you think? It might have been overkill to wear them with my cheetah print scarf from South Africa, but I thought what the heck, let’s go with the animal theme.